In the works of Brenda Mallory and Jenene Nagy, the process of repetition is used both as a method of making as well as a metaphor. Relying on a build-up of discrete marks, both artists allow space in their work for new images and shapes to form. They exploit basic materials to create works whose surfaces seem to shift under close scrutiny. Mallory’s use of the color black allows forms, texture, and rhythm to emerge as primary elements. Nagy begins first with material as a launching off point. 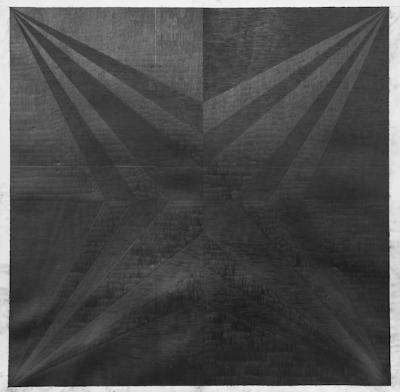 The black as an inherent property of the graphite allows for light to be the protagonist in the work. The resulting effort of both artists’ work create a moment that is simultaneously asserting and receding. Jenene Nagy is a visual artist living and working in the Inland Empire. She received her BFA from the University of Arizona in 1998 and her MFA from the University of Oregon in 2004. Nagy’s work has been exhibited nationally and internationally at venues including the Portland Art Museum, Weatherspoon Art Museum, Southern Exposure in San Francisco, Takt Kunstprojektraum in Berlin, and Samuel Freeman in Los Angeles, among others. Her work has been recognized with grants and awards from the Foundation of Contemporary Art, the Oregon Arts Commission, Colorado Creative Industries, and the Ford Family Foundation. Along with a rigorous studio practice, Nagy is one half of the curatorial team TILT Export:, an independent art initiative with no fixed location, working in partnership with a variety of venues to produce exhibitions. From 2011-12, she was the first Curator-in-Residence for Disjecta Contemporary Art Center in Portland, Oregon. Nagy's work is represented by Samuel Freeman Gallery in Los Angeles, PDX CONTEMPORARY ART in Portland, and Michael Warren Contemporary in Denver. Brenda Mallory holds a BA in Linguistics & English from UCLA and a BFA from Pacific Northwest college of Art. She has received grants from the Oregon Arts Commission, Ford Family Foundation, and the Regional Arts & Culture Council. She is a recipient of the Eiteljorg Contemporary Native Art Fellowship, and the Native Arts and Culture Foundation Fellowship in Visual Art. She has participated in artist residencies including Anderson Ranch, Crow’s Shadow Institute of the Arts, Glean, and the ASU Map(ping) Project. She lives in Portland Oregon, but grew up in Oklahoma and is a member of the Cherokee Nation.